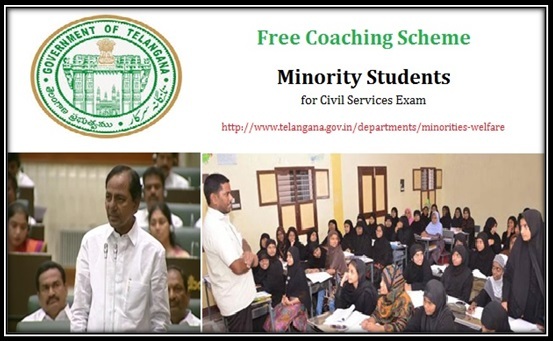 The Telangana state government has decided to facilitate the minority students for the upcoming Civil Service examination through coaching scheme. The state has decided to give 100 students from minority categories financial aid to take coaching classes for the examination in 2018. All these 100 students will be shortlisted by the government only. They will be able to prepare for the examination in the best coaching centres across the state. Also they will be sent to best colleges across the state of Telangana for their study. They can choose over the colleges where they want to study.Central also supports Free Coaching to Minority Students at national level. Minority Group : The scheme is only for the minority students. Students or applicants must belong to minority category. Family Income : Students who are applying for the scheme must not have family income over Rs. 2 Lac per year. Anyone earning more than that would not be eligible for the scheme. Domicile: The scheme is only applicable within the premise of the state of Telangana. Anyone who is not living in Telangana but holds ID proof of the same can’t get the facility as well. Marks Limit : The student needs to secure 60% and above marks in graduation or post graduation to apply for the Telangana Coaching Scheme. Under this free coaching scheme, only those who are preparing for Civil Service Examination will be benefitted. No other stream or examination is listed under this scheme. Under the scheme, the government has chosen 100 minority students from across the best colleges. These students will be eligible for the scheme on the basis of their merits. These applicants will be able to take the facilities from the government while preparing for the exam. Applicants who are from rural areas will get Rs. 5000/- as a grant under the scheme. On the other applicants from urban areas will get Rs. 2500/- under this same scheme. Telangana Coaching Scheme is only for the preparation before Civil Service Examination 2018. This is not related to the main examination. People who will be enlisted under this scheme will get coaching classes free of cost. This entire scheme is governed by the state government and minority and welfare department of Telangana. Central government is not related in this scheme. The main objective of the scheme is to encourage minor students to opt for higher studies. They don’t get much facilities or opportunities to enhance their standard of living. This scheme will help them to do well in Civil Service examination. If they get good jobs they can get good life as well. Also many good students, despite having skill and quality can’t get to any good coaching centres for monetary issues. This scheme will also help them to get into best coaching centres for free. The Minorities Welfare Department of Telangana was established during early 90s. The department solely look after the development of the Minorities in the state. They design many schemes to enhance the social as well as economical standard of minorities with time. The official website for Minorities Welfare is http://www.telangana.gov.in/departments/minorities-welfare#. The DRDA (District Rural development Agency) has invited application forms from youths who are unemployed. The new drive has been taken as an initiative in collaboration with Rural Poverty and Elimination society (SERP). The agency has announced to offer candidates with training sessions for free so they can get opportunity for self employment. In order to take advantage of the free training session, the applicant should be of age group 18 to 35 years and residing in rural areas. Apart from this the government has also announced that the facility will be available for candidates who are minimum of SSC pass , B-Com pass, ITI or Intermediate pass or 8th pass for different courses in tailoring, Computer hardware, DTP, Publishing, electronics or cell phone repairs. As per the training program, candidates will be offered with accommodation facility for free along with employment benefit at the end of the program. The facility will be provided by Swamy Ramanadatirtha Institute located at the Bhuvanagari District in Jalalpur Village. More details can be collected by the candidates from the official DRDA web portal online related to course duration and other criteria.